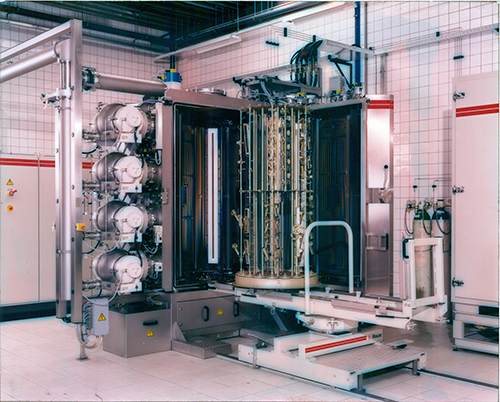 Adhesion of Vacuum Deposited Films and Coatings. Part 2: Adhesion evaluation | Management Plus, Inc. Ideally adhesion tests should duplicate the stresses that appear at or in the interface and near-interface region. These stresses may differ through the life cycle of the coating (during deposition, immediately after deposition, subsequent processing, storage, and service). Adhesion measurement techniques should subject the coatings to reproducible stresses that correlate to satisfactory performance of the coating/substrate structure. The testing procedure(s) may include several tests to evaluate the adhesion under different stress conditions. Accelerated stressing (example: elevated temperature) may be used to simulate long-term conditions, though this must be done with care. Good adhesion may be measured quantitatively such with a pull-test and/or by observation of the behavior of the coating under stress such as with the scratch test. Often adhesion tests are used as a part of the verification that the process is producing a reproducible product (i.e. used as a comparative test). The adhesion tests may be done on a “dummy” part or a “witness” substrate that is representative of the production part (same material, processing, etc.). Most tests are “destructive” since they introduce damage to the coating or contamination on the coating surface. The evaluation of adhesion may begin with studying the nucleation of the vacuum deposited material on the substrate of interest. This may be done in an electron microscope, by electrical conduction, or by optical transmission. Suffice to say that the higher the nucleation density the better the adhesion that may be attained since it shows chemical reactivity between the depositing atoms (adatoms) and the substrate material (see later blog – “Interface formation and its effects on adhesion”). Nucleation studies do not provide a practical means of evaluating adhesion but may be useful in understanding the adatom/surface interaction and in evaluating surface contamination effects on film growth (see later blog – “Contamination effects on adhesion”). Observation of such deadhesion patterns while the parts are still in the fixturing may show high and low regions of stress and stress anisotropy due to fixturing (non-equivalency of positions), variation of energetic particle (ions or high energy reflected neutrals) bombardment during deposition, or the depositing flux angular distribution (texturing). After the parts have been removed from the deposition chamber the adhesion may be evaluated by adhesion tests. One test that can be done easily is the “Mattox bad breath test.” In this test a person breathes on the coating to give moisture condensation. If the coating has a high intrinsic stress level the moisture may accelerate fracture propagation and deadhesion occurs giving blisters or flakes. If the coating cannot pass this test it will fail on more stringent adhesion testing. Obviously the uninformed observer attributes the failure to the bad breath of the tester. There are literally hundreds of adhesion tests that have been described in the literature [1-5]. Figure 1 shows some of the most common tests. The tape (peel) test uses an adhesive tape applied to the film and then peeled from the surface . Usually the coating is scratched before the tape is applied to provide a fracture initiation site(s). 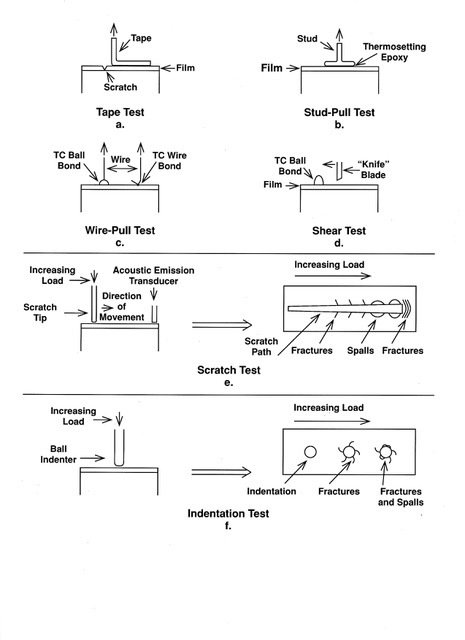 This test has many variables (type of tape, angle of peel, rate of pull, etc.) and reveals poor adhesion but does not quantify better adhesion (i.e. it is mostly qualitative). It has the advantage of revealing spots of poor adhesion (“pullouts”) due to contamination such as dust particles. The pullout material is left on the tape. The pull (tensile) test uses a wire or golf-tee-shaped stud bonded (glued, soldered, ultrasonic bonded) to the coating surface and pulled to failure under tensile stress. This test has the problem that the bonding process may introduce unknown stresses particularly near the edges. A variation of this test is the shear test that uses a blade to push on the side of a bump bonded to the surface. The shear test may also be performed in a lap-shear configuration. The wire bonded pull test maybe used in a non-destructive mode by just pulling to a specified value. The scratch test is performed by moving a progressively loaded stylus over the surface until fracturing or deadhesion is detected optically [7-9]. The test is very dependent on the stylus shape and material and the physical/mechanical properties of the coating material. The scrape test is a more crude form of the scratch test and might be called a wear (abrasion) test. To further characterize the behavior of a scratch the acoustic emission during scratching may be monitored. The indentation test uses a progressively loaded indenter and detecting the fracturing and spalling of the coating around the indenter impression. The indentation test is used most frequently for hard coatings. The indentation test is dependent on the physical and mechanical properties of both the coating and the substrate material though the use of microindentation techniques may minimize the effects of the substrate material. The adhesion of a film or coating to a substrate may increase or decrease with subsequent processing, environments or with time. This change in adhesion may be caused by a number of effects such as diffusion to or away from the interface, stress relief, void formation in the interfacial region, deformation by repeated stressing, chemical effects, etc. Accelerated aging may be used to try to duplicate some or all of these effects but consideration must be given to the fact that interactions between mechanisms may provide misleading adhesion results. For example, heating may increase diffusion rates but may also give stress relief. A reproducible adhesion test program can give a useful comparative measure of the practical adhesion* to help ensure that the deposition process is reproducible and the product is adequate for the function and service life of the product. Adhesion measurement values should never be presented as an absolute or “basic” [2,3] property of the system. * The term practical adhesion is used to include failure in the interfacial region or in “near-by” substrate or coating material . This entry was posted in Uncategorized on February 25, 2019 by admin_29823.